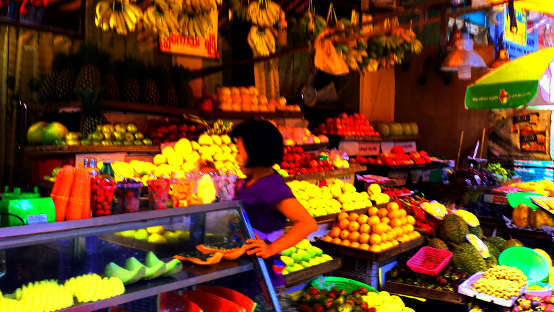 If you decide to live in Yangon for an extended period like a number of foreign businessmen, sooner or later you will need to do some grocery shopping on your own. There are a number of supermarkets in Yangon like Ocean Supermarket and City Mart where you don't need to speak anything. However, those supermarkets may not be in the vicinity of your neighborhood. It is much more convenient to rely on your neighborhood shops and markets to buy fresh fruits, meat, vegetables, bread and eggs. The Burmese word for market is zay3. If you can't go to zay3, then it will come to you. In many residential areas, the sellers go around the neighborhood with a big basket of meat, fish, and chicken balanced over their heads. Some fruits and vegetables sellers use trolley carts to push around the streets and cry out what they are selling using their trademark sales pitch. You may not always understand what they are shouting even if you know some Burmese. Even Burmese like me sometimes don't know what they are shouting. In one case, I heard someone selling ga1-nun3 dway2.. ga1-nun2 dway2.. I ran out to catch the seller expecting some fresh or cooked crabs but it turned out to be the print out results of the state lottery. Ga1-nun3 in Burmese also means "numbers". kji1 means "to look". kji1 chin2 is the desire to look. kji1 chin2 deare2 can also be translated as "I want to look." But, the feeling tone is not so blunt as such. It's more like, "Let me have a look." or, simply ask: beare2-lout leare3 -- How much? In supermarkets, kilogram is used to measure weight for meat, cooked food, fruits and other food stuff such as bags of rice. The local weight scale used in neighborhood shops and markets is called pate-tha2, (viss) which is divided into 100 kjut-tha3 (ticals). If you buy ta1-bate-tha2 (one pate-tha2) of meat, you will get about 3.6 lb ( 1.6 kg), which is simply too much for a typical Burmese family who buys fresh vegetables, fish or meat almost every day. if you ask: "beare2-lo2 youn3 tha1-leare3" (how much are you selling ? ), the seller will reply you in terms of kjut-tha3, which is shortened as tha3. Updates: 10 tha3 of beef that cost 600 Kyat in 2012 costs 900 Kyat in December 2014, 1000 kyat in June 2015, and remains the same as of July 2016 in Yangon. The price of chicken relative to beef and pork comes down and cost about 700 Kyat. Pork, depending on which part, cost around 700 to 900 on the average in July 2016. The meat part without fat is around 1100 Kyat and spare ribs are 550 Kyat. The premium spare ribs with soft bones are expensive and ordered by hotels and restaurants in advance, so you will not find it in the market. Myanmar Grammar Notes: Question words such as beare2-lo2 and beare2-lout can be either pronoun or adjective depending on the sentence. In the above question, beare2-lo2 is a clear reference to a-meare3-tha3 (noun) so, it is an adjective. If the word da2 - pronoun "this" is used in place of beef, beare2-lo2 becomes a pronoun. Sometimes, you may hear the word "ba2" appended to the answer to soften the tone. chout-ya2 ba2 -- Oh, it's 600. Unlike in the supermarkets, fruits and some vegetables in neighborhood markets are sold in quantity, bunches, or in bundles. Updates: The price of mangoes as of June 2015 cost about the same as they were in 2012. The more expensive export (to China) variety called "Sain2-ta1-lone3" are sold 3 for 2000 Kyat in 2016 rainy season. Updates: The price of an egg (medium to large size) as of June 2015 cost around 120 Kyat and remains stable at this price in July 2016 while duck eggs are sold 150 Kyat each. Myanmar Grammar Notes: ta1-lone3 refers to the quantity of eggs without mentioning the word "egg" (noun) so, it is a pronoun. On the other hand, ta1-lone3 in kjet-u1 ta1-lone3 is an adjective. June 2015 Updates: The prices of some vegetables such as watercress, spinach, green pepper, cucumber, and tomatoes are relatively stable and abundantly available. But, there appear to be less amount in the size of the bundle. July 2016 Updates: Roselles (chin2-boun2) are most affordable with 50 Kyat a bundle, while watercress (ga1-zoon3-ywet) are fresh and abundant at 100 Kyat a bundle. Djenkol bean (da1-nyin3-thi3) is 50 each. Those three are luxury items for Overseas Burmese people who are dying to have those, and pay high price in some other countries if available at all. 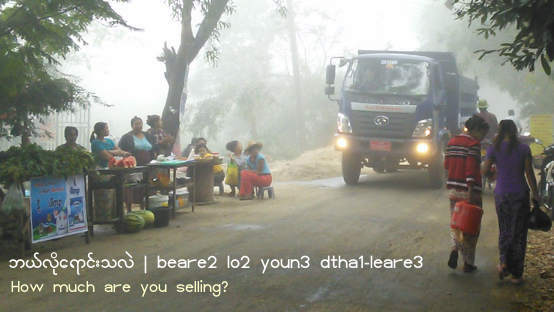 Although the phrase: beare2-lo2 youn3 tha1-leare3 sounds more colloquial for an item that the seller can mark up the price and sell it as he or she wishes, the phrase "beare2-lout leare3 - How much?" sounds more natural for items with more or less fixed prices, such as bread that is distributed by the wholesaler. How much for any item? You are almost certain to get nga3 | fish everyday from the neighborhood shops and sellers who go around the residential areas. In special occasions, Burmese people poun3 | steam the nga1-tha1-lout | hilsa fish for several hours until bones are tender and can be eaten. If you want to try out the taste of nga1-tha1-lout poun3 | steamed hilsa, you can buy it in the canned food sections of the supermarkets (and even in neighborhood shops) on the same shelves as tuna and sardine. Average Burmese will be familiar with nga3-thit-ta2 nga3 | sardine both fresh and in tin cans, but imported tuna is much more expensive, and can only be bought in tin cans. ba1-zoon2 | prawns and smaller ba1-zoon2-hsate | shrimps are abundant in Myanmar, and you can get those fresh from the markets. There are shrimp farms in Myanmar, but since shrimp farming is a lucrative business for export with more profits, fresh seafood you get from the local markets are most likely from the rivers and coastal areas caught by the fishing boats. beare3-tha3 | duck is less common than kjet-tha3 | chicken, and they are often bony. 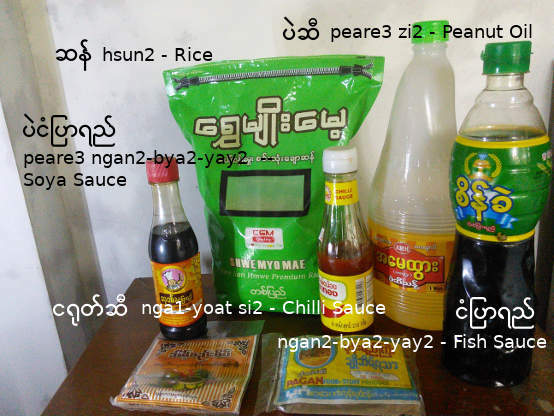 However, you can easily get beare3-u1 |duck eggs, which the Burmese use for cooking mone1-hin3-kha3 -- Burmese favorite for breakfast with rice noodle in fish gravy. If you have craving for Chinese Peking roasted ducks, the best is to go to restaurants like Golden Duck where you can get ducks with more meat than bones. There are two types of kjet | chicken. The first type is grown in big chicken farms and those come in the same size as in Western countries. Those big size chicken are called mway3-myu2-yay3-kjet | poultry farm chicken. Second type is ba1-ma2-kjet | Burmese chicken preferred by some people for its "sweet" taste. There is a Burmese saying: When it comes to meat, pork is the best; for fruit, mango is the one; pickled-tea is chosen among the leaves. Wet-tha3 | Pork is sold in different prices. The most expensive part is meat only without any fat. But, the price difference is not that substantial. Interestingly, some Burmese also avoid taking pork just like Muslims. When I was young, for example, you could not bring pork to Mount Popa because local people believed that certain Nats (supernatural beings) like byut-ta1 who was a Muslim seaman executed by King A-nau2-ra1-hta2 disapproved of it. I am not sure if this tradition has changed, but it does make sense to avoid animal fats for health reasons. Myanmar has three seasons. The cooler "tourist" season is from October to March when nights are pleasantly cooler than hot summer months from April to about June. You can expect heavy rains and thunder storms from June to September. The rain seems to be heaviest around July, and then tapered off towards the end of October. You can get sa1-tau2-beare2-yi2 | strawberry, za1-byit-thi3 | grapes, pan3-thi3 | apples, kjweare3-gau3-thi3 | grapefruits, and lite-chi3 | lychee grown in highland regions during those "tourist" seasons when the temperature could drop below freezing point in some parts of the country. Around Christmas to Chinese New Year, you can get oranges and tangerines of different sizes, types, and names. If you visit Myanmar during the rainy season, you can eat tha1-yet thi3 | mangoes all you want, and they are not expensive like in the US or Canada. You can also get durians during summer till the end of the year. Rainy season is the season of fruits when you can have your stomach filled with na2-nut-thi3 | pineapples, min3-goot-thi3 | mangosteen, au3-za2-thi3 | custard apples, met-moon2-thi3 | peaches, thit-tau2-thi3 | Asian pears, ma2-la1-ka2-thi3 | guavas, pain3-neare3-thi3 | jack fruits, zi3-thi3 | plums, and kjet-mout-thi3 | rambutans. There seems to be two seasons for pfa1-yeare3-thi3 | water melons. You can get it in the summer till the start of rainy season, and again around December. You can get papayas and bananas in all seasons. Fruits are sold in a way quite similar to other countries. Bananas are sold by the bunch. Grapes and a type of small size oranges called pya3 lain2 mau2 are weighed, and strawberries are sold by the basket. Bigger fruits like durians, and pineapples are sold by a single quantity, whereas mangoes are sold in the quantity of 3 or 5. For a longer list of fruits in Burmese, please refer to the table on the left. You can get eggs, bread and grocery items in neighborhood shops and corner stores. But, be sure to stock up enough food (especially bread) before thin3-jan2 (water festival) and Burmese New Year in mid April. Shops will be opened for limited hours if not closed for several days. Also beware of price hike ups for items like fish and meat just before the shut down. It must have been a long, long time since Burmese people last used coins. In the past, Kyat ( pronounced kjut with silent "t" ) was divided into 100 pya ( pronounced pya3.). Pyas were coins, such as 5 pya, 10 pya, 25 pya, and 50 pya coins. Due to inflation that had shot up several folds in the 1980's, the smallest denomination you see today are 5 kyat notes, and 10 kyat notes. They are sometimes stapled together in 50 kyat amount; only then they become a meaningful amount to buy anything at all, or to return as a small change. 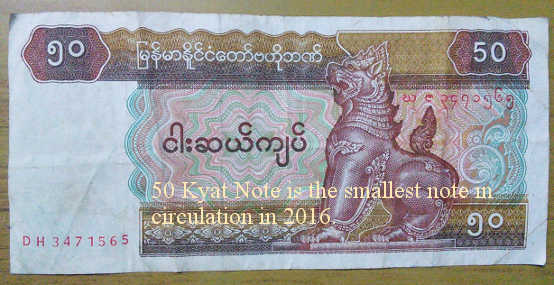 As of 2014, even those have disappeared, and the smallest note you see is 50 kyat note. Burmese kyat notes in the denominations of 50 kyat, 100 kyat, and 200 kyat notes are considered small changes, and called a-kjway2. Those small notes used to be notoriously dirty, worn-out and in sorry conditions, but in the year 2011, the government banks have started to replace those with newly printed notes. In that case, you will end up buying something extra to make the total amount closer to the multiple of 1,000 kyat notes. As a last note on the subject of small notes, don't be surprised if the shopkeeper gives you some sweets in place of the change.